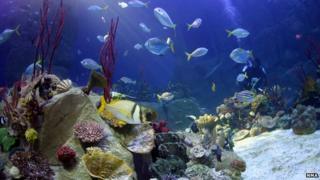 People who spend time in aquariums could improve their physical and mental wellbeing, a study has suggested. As well as improving people's mood, the experiment showed "significant" reductions in participants' heart rates and blood pressure, the authors added. Previous studies have linked contact with nature and improved wellbeing but this study is believed to be the first controlled experiment of its kind. The findings appear in the journal Environment and Behavior. "There have been a few studies that have looked at things like the number of bird or butterfly species in parks and researchers have asked people in those parks about how they felt," explained co-author Mathew White from the University of Exeter's European Centre for Environment and Human Health (ECEHH). "Generally, people felt happier in parks that had more birds or more butterflies, although people did not really appreciate the levels of biodiversity." Dr White told BBC News that there were a number of reasons why the team of researchers from the ECEHH, Plymouth University and the National Marine Aquarium were interested in the potential impact of aquariums on people's wellbeing. "Firstly, we were particularly interested in aquatic environments," he said. "Obviously most people cannot see different kinds of fish because they do not dive etc, so aquariums are a nice way to make the invisible marine environment just outside our doors visible and accessible. "More fundamentally, we were interested in how natural environments could be brought to urban populations and to people who might not be able to access nature very well." Collecting data from participants in the aquarium provided the researchers with a unique opportunity to examine the links between human wellbeing and contact with nature. "What we were able to do here was - as far as we know in the world's first controlled experiment: we knew exactly the number of species and the number of [fish] that people were looking at, and they were systematically altered over time - monitor people's heart rate, blood pressure and various changes in mood over a 10-minute period while they watched the very large tank (500,000 litres), " Dr White explained. "As you might expect, people felt a lot more relaxed and significantly happier after watching the tank with more fish - in other words with more biodiversity - and there were significant drops in heart rates and significantly lower blood pressure. "Most of the physiological changes happened within the first five minutes and then plateaued out, so it happened quite quickly and then stabilised. However, the psychological measures showed that the benefits continued over the entire exposure - people got happier and happier, basically." In order to rule out the possibility that the participants were responding to the biodiversity in the tanks rather than the tranquil environment, the first set of data was gathered while the participants looked at an empty tank, which only contained rocks and lighting etc. The experiments were carried out during the day while the aquarium was open so people taking part in the experiment were experiencing the normal conditions of the aquarium, such as noise etc. Dr White added: "The first thing to notice is that people relaxed, even watching an empty tank, and the benefits increased as we introduced more fish over the course of about a four-week period." The team were interested in exploring whether the experiment's results could be replicated in a medical setting. "For example, if we were to put a live (video) link into Derriford (the local hospital) into waiting rooms or even into some of the wards and we could show clinically meaningful reductions in heart rate and blood pressure among specific groups, such as hypertension for example, it could be really important for medical reasons," Dr White suggested. He also said the findings also highlighted another potential ecosystem service that humans received from biodiversity. "If you flipped our study on its head, and you were to take fish away and be losing biodiversity, what we show is that the predicted losses in biodiversity over time as a result of climate change and other anthropogenic threats could actually undermine human wellbeing in a way that we have not really thought about. "Potentially, the effects could be quite large and could be another effect of climate change etc that we have not really understood to date."